FindMyPast has created a new British and Irish Roots collection which allows researchers to search a wide variety of records spanning more than 400 years of migration between the British Isles and North America, all in one place. It holds some 98 million records. Please note that this is not a brand-new resource. Instead, it is a specifically packaged collection that draws from a wide range of FindMyPast's existing records and gathers together those that list origin or place of birth in Ireland or Britain. Millions of passenger lists, census records, naturalization applications and draft registrations, as well as birth, marriage, and death records spanning more than 400 years (1573 to 1990) of migration between the geographical British Isles and North America can now be explored in one unified search, enabling North American family historians to trace the migration of ancestors from the Old World to the New through one simple search. 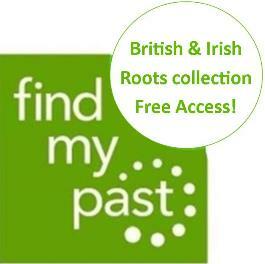 To launch the new resource, FindMyPast is opening up the British & Irish Roots collection with free access. This period of free access has not been defined, so free access may be removed at any time.